The online version of this article ( https://doi.org/10.1186/s13046-019-1150-y) contains supplementary material, which is available to authorized users. With the development of high-throughput sequencing, the transcription of short or long noncoding RNAs (lncRNAs) from human genome has been uncovered, representing a great breakthrough [3, 4]. LncRNAs, with a length > 200 nt, have no or limited protein coding capacity [5, 6]. Based on its location to the nearby coding genes, lncRNAs can be classified into five types including sense, antisense, intergenic, bidirectional and intronic . Emerging evidences have documented the diverse roles of lncRNAs as a molecular modulator in regulating multiple biological process, such as guides, scaffolds, tethers and decoys [8, 9, 10]. 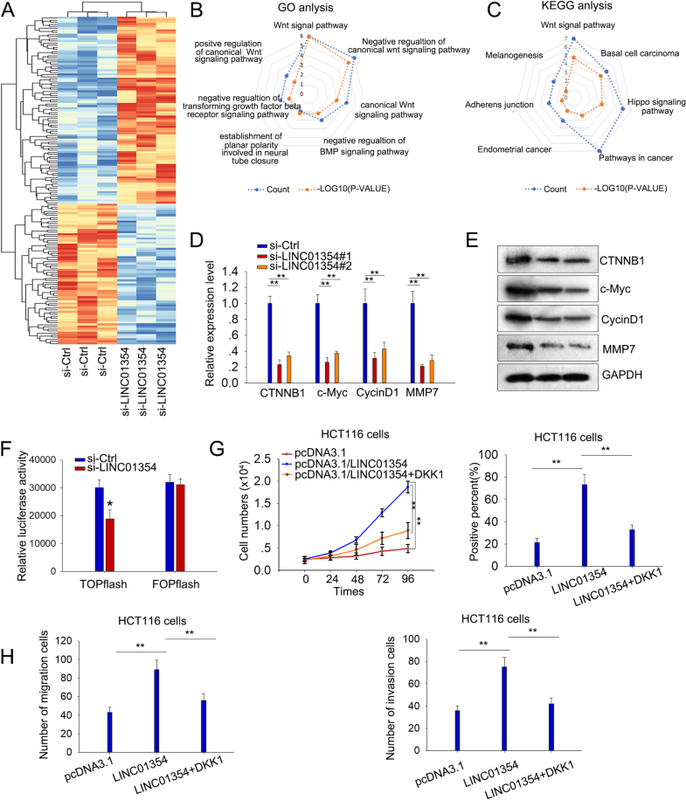 For example, lncRNA PTTG3P contributes to the proliferation and metastasis of HCC cells through modulating PTTG1 via activating PI3K/AKT signaling in hepatocellular carcinoma ; Li D. et al. 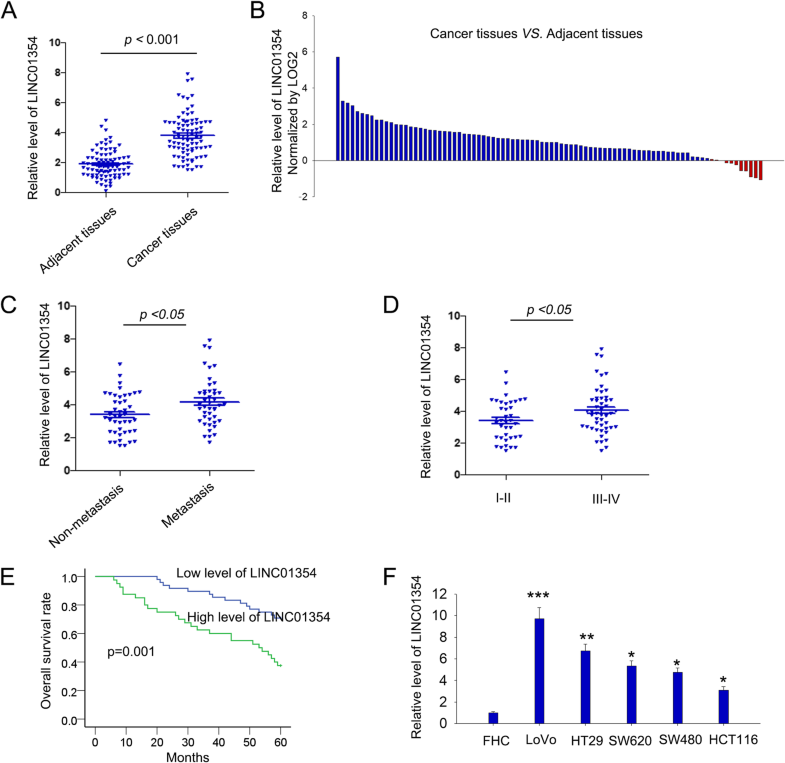 reported that Ets-1 promoter-associated lncRNA could drive the progression of gastric cancer through regulating NONO/ERG/Ets-1 axis ; Wang Y. et al. demonstrated that lncRNA DANCR, severing as a competitive endogenous RNA, contributes to ROCK1-mediated proliferation and metastasis through decoying of miR-335-5p and miR-1972 in osteosarcoma . Long intergenic noncoding RNAs (lincRNAs), a class of transcript units discretely intervening between the protein-coding loci, have been characterized to exert important functions in multiple cellular processes, including tumorigenesis. For instance, lincRNAs termed HOTAIR and XIST have been reported in many cancers, including breast cancer, gastric cancer and glioblastoma, participating in a variety of important cellular processes, such as X chromosome inactivation, genomic imprinting, and so on [14, 15, 16, 17, 18]. Also, recent years witnessed the identification of a number of lincRNAs as key regulators in the initiation and progression of CRC [19, 20]. However, there remains a long way to the full understanding of the lincRNA-mediated regulatory mechanism behind in CRC pathogenesis and progression. In subsequence, we attempted to explore the mechanism through which LINC01354 regulated CRC. It has been known that lncRNAs participate in cancers though modulating gene expression and pathways [8, 9, 10], so we speculated that LINC01354 could regulate CRC through this way as well. Firstly, to identify the target genes modulated by LINC01354, we performed an mRNA profiling analysis in LINC01354-silenced LoVo cell lines. 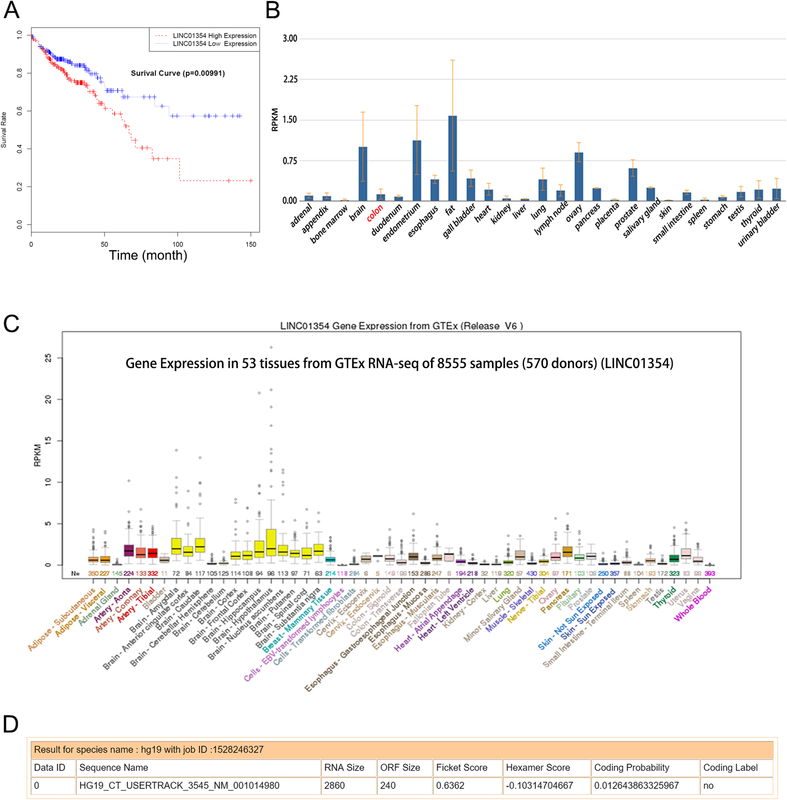 67 genes were found statistically down-regulated more than two-fold in response to the knockdown of LINC01354 (Fig. 5a). We then conducted KEGG and GO analysis and identified the high enrichment score of Wnt/β-catenin signaling pathway among the downstream pathways of LINC01354 (p < 0.001; Fig. 5b-c). By applying qRT-PCR and western blot analysis, we confirmed the down-regulated mRNA and protein level of genes (CTNNB1, c-Myc, CycinD1, and MMP7) involved in Wnt/β-catenin signaling pathway in LINC01354-silenced LoVo cells (Fig. 5d-e). 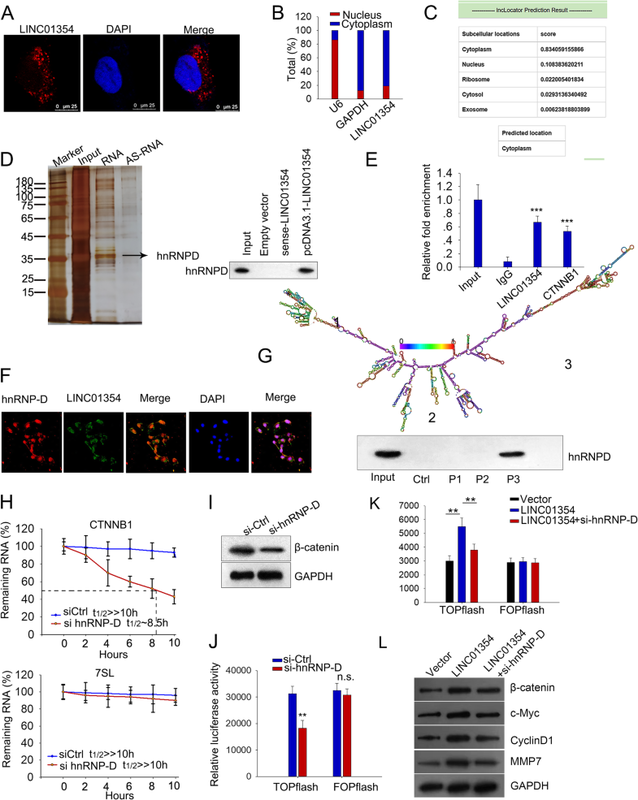 TOP-Flash luciferase assay revealed that LINC01354 downregulation inhibited Wnt/β-catenin pathway activity, certifying that LINC01354 played critical role in activating Wnt/β-catenin signaling (Fig. 5f). 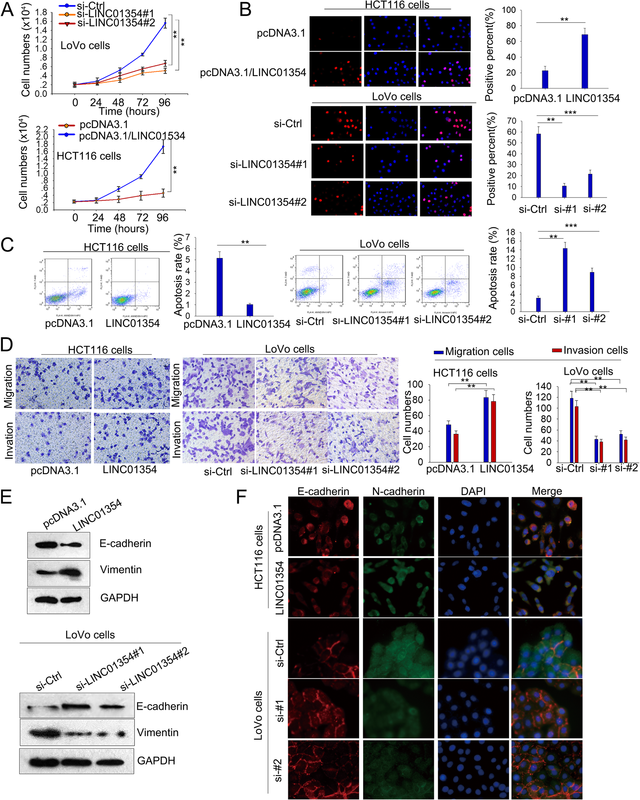 To further investigate whether LINC01354 regulated proliferation and metastasis in CRC cells through Wnt/β-Catenin signaling, pcDNA3.1/LINC01354-transfected HCT116 cells were treated with DKK1, the secreted antagonist of Wnt/β-Catenin signaling, for rescue assays. CCK-8 and EdU assays revealed that the pro-proliferation function of LINC01354 was partially vanished when treated with DKK1 (Fig. 5g). Besides, DKK1 treatment also abrogated the promoting function of LINC01354 overexpression on migration and invasion of HCT116 cells (Fig. 5h). 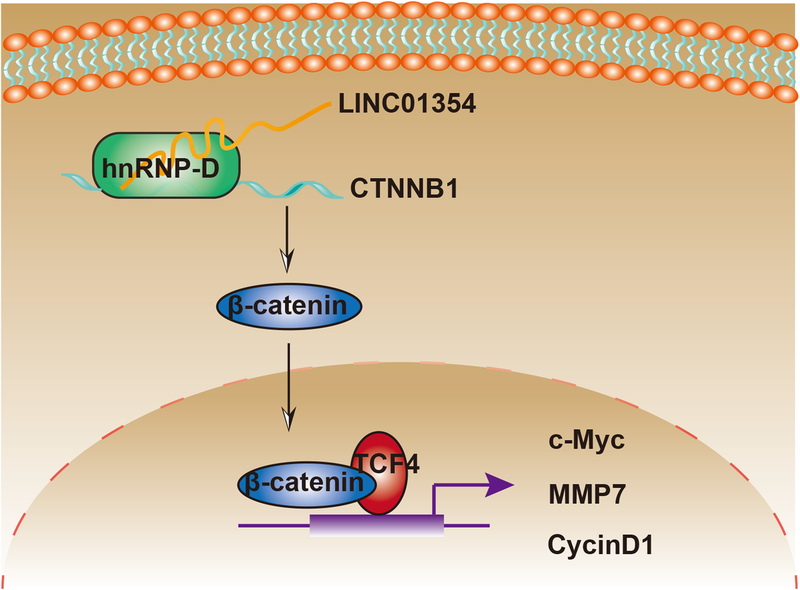 These findings revealed that LINC01354 might exert oncogenic function at least partially through regulating Wnt/β-catenin pathway. 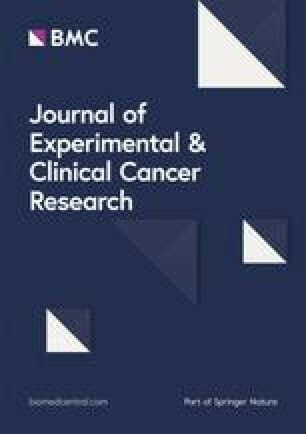 Currently, lncRNAs have been clarified by emerging evidence as active biological molecules rather than ‘transcriptional noise’, which can drive carcinogenesis through regulating cellular processes, including promoting cell proliferation, preventing cell apoptosis, facilitating cell metastasis, modulating cell differentiation, and so on [24, 25, 26, 27]. 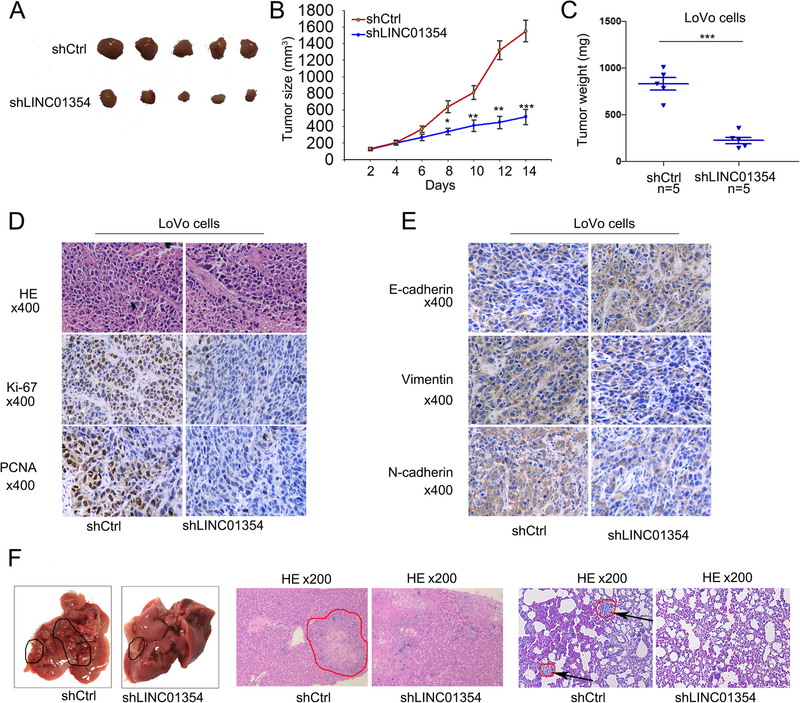 For instance, HULC, up-regulated by CREB, could contribute to the initiation and progression of liver cancer through interacting with miR-372 ; lncRNA PVT1 favors hepatocellular carcinoma cell proliferation and stem cell-like property by stabilizing NOP2 . According to the location, in cytoplasm or nucleus, lncRNAs realize their function through the regulation of target genes at different levels, including transcriptional, post-transcriptional and epigenetic levels. 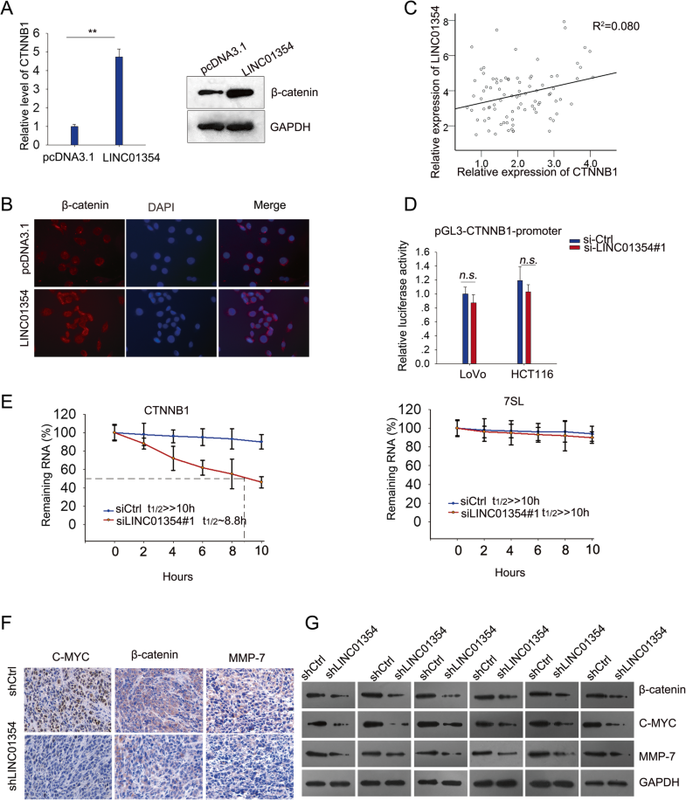 In the nucleus, for example, lncRNA HOXA11-AS facilitates the proliferation and invasion of gastric cancer cells at epigenetic level through scaffolding the chromatin modification factors PRC2, LSD1, and DNMT1 . In the cytoplasm, lncRNAs could exert their function through regulating protein localization, modulating mRNA translation or stability.